Earning coins and paw points is the key to enjoying this virtual world. Each player starts out with a one room house and yard to decorate. As you level up in the game additional rooms are unlocked. 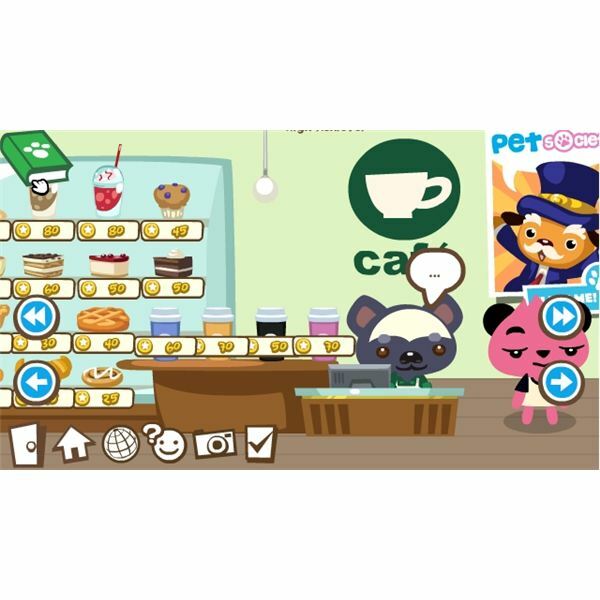 Furniture, clothing, food, and other cool gadgets can be purchased using your pet society coins. Dress up your pet avatar in the latest apparel and furnish your home to express your unique tastes. All of your fellow Facebook friends in Pet Society can drop by at anytime for a visit or game. This Facebook Pet Society Beginner’s Guide will teach you the essentials for achieving pet health, happiness, and coins. After you customize your virtual pet a short tutorial with the Mayor of Pet Society will begin showing you the ropes. This tutorial will break down the features in Pet Society and explain how to care for your furry friend. There are three gauges on the side of the screen. They monitor the health, happiness, and cleanliness of your pet. Maintain all three bars high for a playful companion. Health status is restored by feeding your pet. Happiness increases each time your pet is brushed, played with, or mingling with friends. Buying certain luxury furniture items can also boost your pet’s happiness status as well. Cleanliness is restored by grooming your pet. If the cleanliness meter drops too low flies will appear. At the bottom of the screen is a chest icon and shortcut map to the town. All of your items will be stored conveniently in the chest. Simply click and drag on any item to use it. Earn coins to buy your virtual pet the best food, furniture, clothes, and gadgets in the town. Paw points are required to level up in the game and keep your pet living a lavish lifestyle. 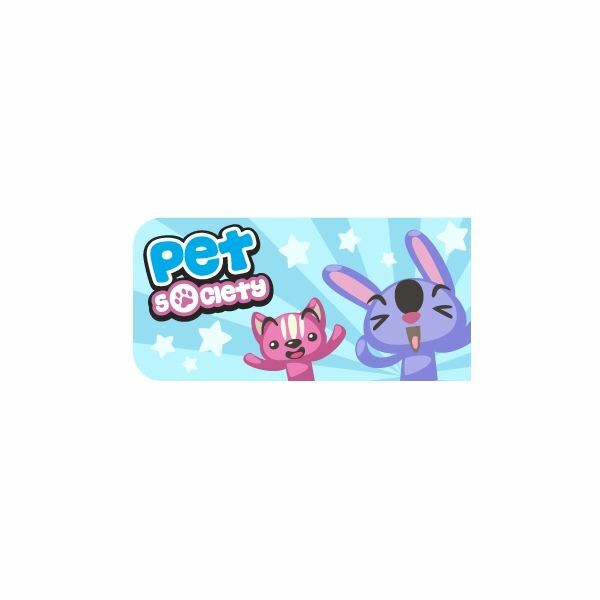 Players get paw points when they participate in Pet Society games and activities involving in caring for their pet or friend’s pet. Every time a player sends a gift to a friend they get paw points as well. There are various ways to earn coins in Pet Society. Each day players receive a random lottery prize with 50 or up to 500 coins. Players are rewarded coins for achieving trophies, visiting friends, and playing with their pet. If you visit 25 friends in Pet Society you’re awarded the ‘Pet About Town Trophy.’ Trophies come in bronze, silver, or gold. Each trophy award ranges between 50 and 150 coins. 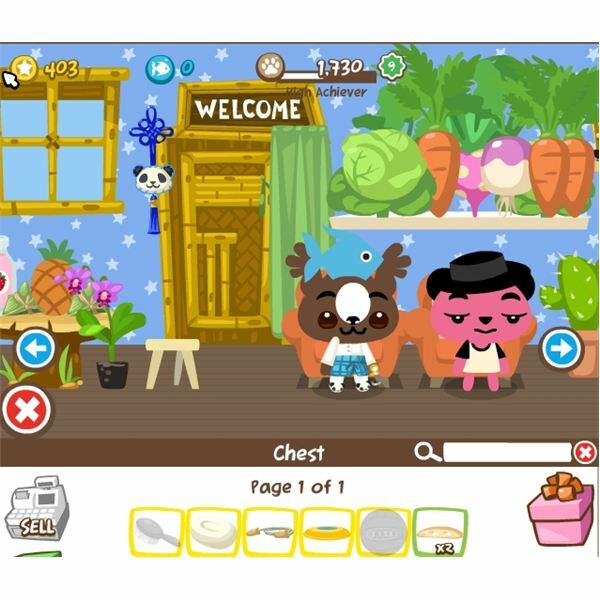 Players receive 20 coins per friend they visit which can really add up if you have a lot of Facebook friends in Pet Society. Playing with your pet can be done in three different ways. Owners can participate in a round of ball, Frisbee, or jump rope. These fun games keep your virtual pet happy and earn you bonus coins. Trophies are also awarded if you perfect game like passing the ball 30 times in a row without dropping it between you and your pet. Racing your friends in the ‘Stadium’ can earn up to 30 coins if you win. Players also have the option to bet on their friend’s races. Washing or brushing your pet can yield several coins also. The old saying, “Money doesn’t grow on trees” isn’t necessarily true in Pet Society. There are coins hidden in the trees around the neighborhood. Take a stroll or several through the trees and coins will fall out. This is a great way to make extra money when you’re a few coins short for a purchase you desire. Another wonderful trick to rake in the Pet Society coins is by shopping at the ‘Mystery Center.’ This technique is a gamble but it can be a prosperous one if you’re lucky. Buy a ‘mystery box’ and re-sell the items inside. Sometimes these packages can contain an expensive furniture or luxury item worth a hefty amount of coins. Planting crops or gardening can earn pet society coins also. Visit the ‘Garden Center’ to purchase tree, vegetable, or flower seeds for planting. Sell your crops for coins, save them for food, or send as gifts to friends. Fishing is another activity players can indulge in Pet Society. Although, it may seem unprofitable fishing can be an excellent method to gain coins through your recycling bin. Each time players visit the pond and go fishing they have an opportunity to catch either junk or a fish for their aquarium. Any junk you catch can be recycled and added towards your recycle points. When players reach 10,000, 20,000, or 30,000 recycle points they can cashed out for that same amount in coins. An assortment of exotic fish can be caught at the local pond. Adding colorful fish to your aquarium at home can add a nice touch to your home decor. Fishing is a fun pastime in Pet Society Town. Earn additional Paw Points by feeding your friend’s pets. Players can earn up to 117 Paw Points and level up more quickly. Plant a garden with plenty of vegetables and trees. Sell the harvests and make up to 2,000 extra coins. When competing in hurdle races instead of jumping over banana peels click on the bananas to remove them from your lane. This keeps you from slowing down your pace. Try to jump just before you approach the hurdle support beam for a successful race. Recycle flowers for a higher bonus in recycle points. Avoid surveys and other offers that claim you’re receive free coins. Most of them are rip-offs.